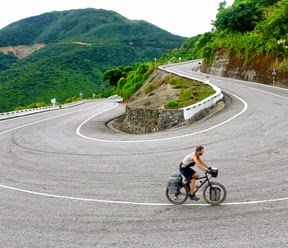 There is also the opportunity to explore Vietnam from Saigon to Hanoi by bike, Hung Nguyen rider had interesting experiences, when trying himself on the highway 1 throughout the country to enjoy different feeling. Morning sunrise in the village of Bình Thuận. Afternoon boats moored on the river Ca Ty – Phan Thiet. The coastal salt fields – Ninh Thuận. Hai Van – The central coastal passes with a side hill, one side is the sea. Sunset on the highway 1A. A fishing village in Phú Yên. Flooded field in Bình Định. Sunset in Tràng An – Ninh Bình. A shoot in the Northwest village in Việt Nam.